GRAMMY and ARIA Award winner Keith Urban will return to Australia in January and February 2019 with his all-new Graffiti U World Tour Australia, his first tour in more than two years. The Graffiti U World Tour is already underway in the U.S. and features a brand-new concert production – a two-hour plus show highlighted by the first live concert performances of new songs from Graffiti U, including Parallel Line, Coming Home, and Never Coming Down. Graffiti U World Tour Australia features special guest and Grammy nominated artist Julia Michaels. General public tickets go on sale at 11am on Monday 6 August via www.ticketek.com.au, with the Telstra Thanks pre-sale beginning at 10am on Wednesday 1 August. "This Graffiti U World Tour is by far the most insane energy we've ever seen at our shows. I always love being able to bring the tour to Oz, but to also have Julia Michaels with us this time is incredible – and will be the first time we've ever toured together," said Urban. "The way the record has been embraced here too is extraordinary – so being able to bring those songs to life and have everyone singing them with us will be seriously awesome!" The Graffiti U World Tour Australia will commence on 23 January at Newcastle's Entertainment Centre, followed by 25 and 26 January at Qudos Bank Arena, 27 January at Canberra's GIO Stadium, then will head to Brisbane's Entertainment Centre on 31 January and 2 February, before concluding at Rod Laver Arena in Melbourne on 5 February. Joining Urban on his Graffiti U World Tour Australia is American superstar, Julia Michaels. With a CV that boasts songwriting credits for the likes of Shawn Mendes, Justin Bieber, Selena Gomez and Britney Spears, Michaels burst into the spotlight with her hit Issues, reaching No. 5 on the ARIA Singles Chart. Michaels teamed up with Urban last year to write the infectious single Coming Home, on which she also contributes guest vocals. It will be Australian fans' first opportunity to see Michaels live in arena setting. Of the opportunity Michaels said, "I am so excited to be joining Keith on his Graffiti U World Tour Australia Keith is an incredible artist and one of my favorite human beings, and I can't wait to hit the road with him." Graffiti U is Urban's first new studio album in nearly two years. The highly anticipated follow up to 2016's record-breaking, #1 Platinum album Ripcord, Graffiti U is a natural musical progression that began with Fuse, but it also marks where Urban currently resides creatively. 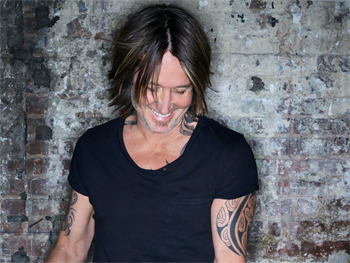 Keith Urban has consistently topped charts in Australia and the U.S. over the last decade, amassing more than 22 million album sales worldwide with combined sales of 1.4 million albums in Australia. His last album Ripcord was the second highest selling album in Australia in 2016 and the highest selling album for an Australian artist that year. Ripcord spent 27 weeks in the top 10 and 46 weeks in the top 20 of the ARIA Albums Chart. Keith Urban has total of 14 ARIA Platinum selling singles and albums and has scored 5 ARIA Awards.